Svetlana (Subshri) Janardan the first Russian Sitar exponent of Hindustani Classical Music, who has internationally placed herself among the sitarist of today’s generation. 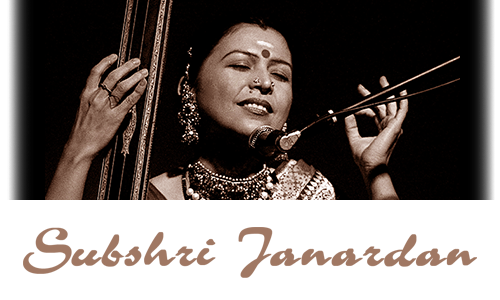 She is also equally renowned Vocalist of Delhi Gharana. Svetlana completed her initial studies of music from Gandharva Mahavidyalya Delhi, one of the leading institutions in India. Completed Sangeet Alankar Vocal music. She did her intensive studies in Gayaki (Vocal Style) and Tantrakari (Instrumental) ang in Sitar under the tutelage of Dr. Maya Bhatacharya. Svetlana has superb control over the instrument and her style is unique and innovative blending of intricate Gayaki Ang (Vocal) and Tantrakari Anga (Instrumental). It is necessary to mention that Svetlana sings in many different Indian as well as foreign languages. She has received numerous awards and appreciations. She has been the ambassador in spreading Indian Classical Music all over world for last ten years. She has been teaching Indian Classical Music in Moscow Conservatorium regularly and conducted many workshops and Concerts to her credit. - North Zone Cultural Centre. - South Zone Cultural Centre.